Good Morning everyone and this is Manu here !! I hope you are having fun with our current theme this month of making a mini album and we are looking forward to seeing your creations!!!! Incase you have not played along yet, do so by today for today is the end date to enter your creations in the challenge! A pretty memories themed album is what I have made to showcase 2 popular types of interactive elements in the albums, The waterfall element and the accordation fold. The albums also have more interactive pages and elements inside with lots of flaps and hidden pages!! Totally loved the pastel shades this album has! Here's the glimpse of the album! I have kept it simple for the basic reason that I want the pictures to shine through the album on the whole! Here's how to make the waterfall element. It looks pretty complex with all the tutorials listed on the web, but believe me, once you figure out how to make it, there's no looking back and it takes very little effort to make them then! My waterfall element has space for 5 pics. Cut out 5 flaps of 4*4 inch size. You would also need a long strip of paper. I had mine of the 1.5*14 inch measurement. Now take the long strip and score it at .75 intervals each. This step needs to be done 5 times. so in the end you'll have the scoring at .75, 1.5, 2.25, 3 and 3.75 inches. Now take one of your 4*4 flap and attach it to the first .75 scored area. The second 4*4 flap to the second .75 are and repeat the process. Once all the 5 flaps have been attached, fold the remaining piece of the long strip. You would just need to put the brads in there for the strip of paper which holds the entire waterfall element and put a little glue on the last flap (the inner most) to hold it with the vertical strip of paper. Here are some more pictures of the album. How are you all doing? Have you been checking out the different types of mini albums and types of insert which you can use while creating a mini album. The DT has been working hard to come up with different ideas for each one of you. 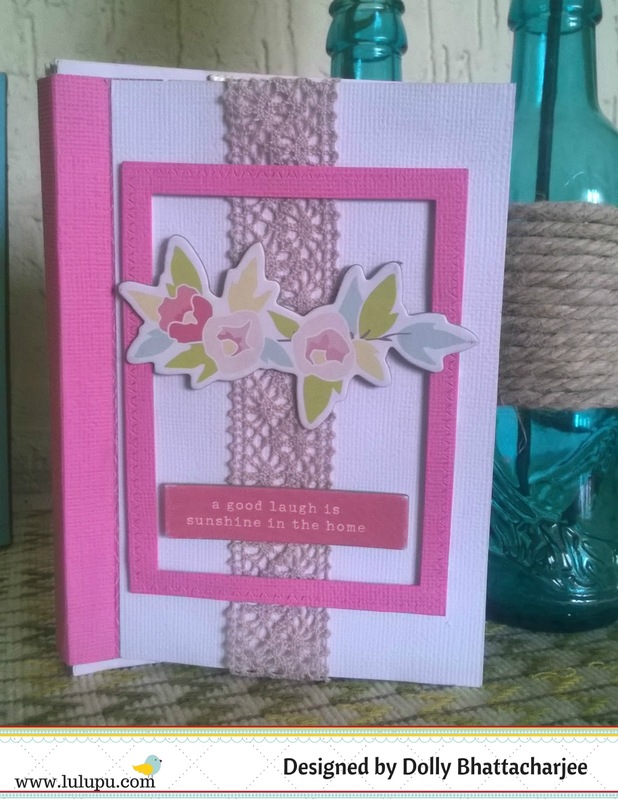 Today, I will be sharing a mini album which is made from A2 envelopes. Yes, you heard that right. 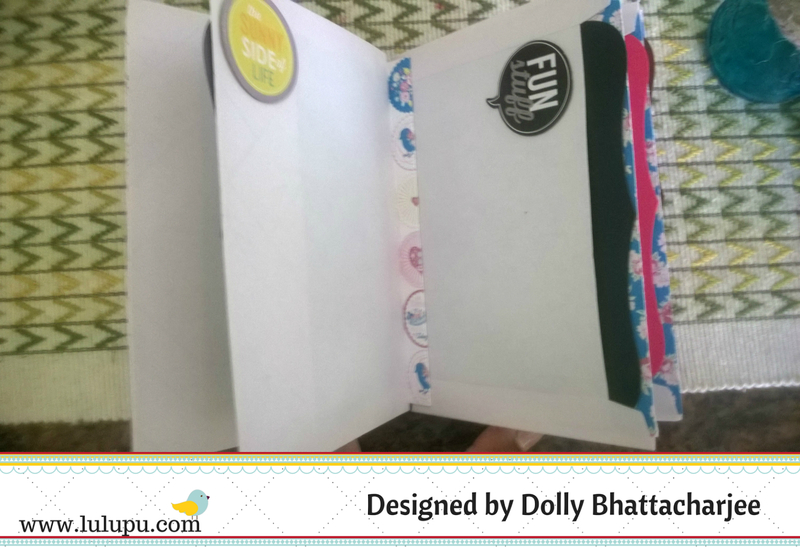 You can make quick and easy mini albums using A2 envelopes. For my inspiration - check out Paper suite. She has fabulous instructions and a video as well. I decorated the front panel using some pretty chipboard pieces and a decorative lace from my personal stash. 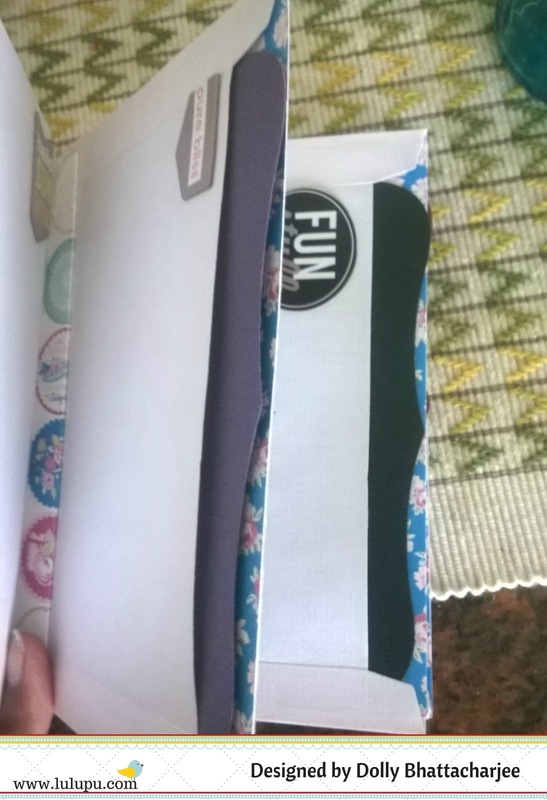 The inside looks somewhat like that, which I have embellished using some fun stickers and added a die cut photo mat inside each envelope. Neha here with my second post for this month. This month's theme is make a mini and you can find all challenge details here. 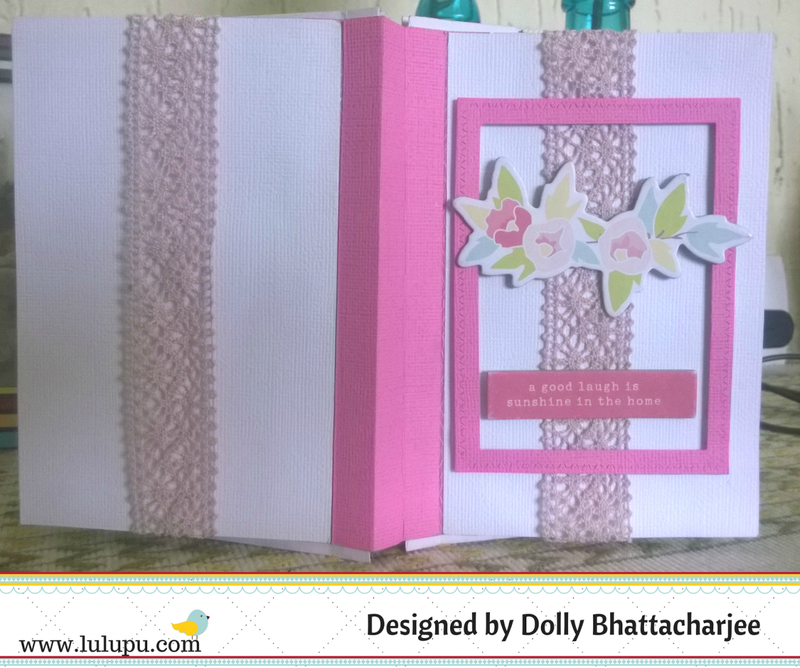 Toady I am sharing with you a pinspired Z flap album and I have prepared a pictorial as well. 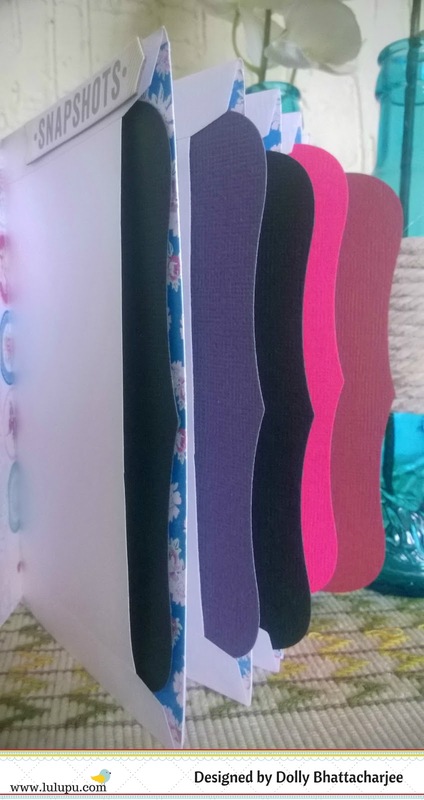 This one is a flip album and has been done with stack the deck binding. Each page in the album has a flap on one side and a pocket on other, holding a photo mat. 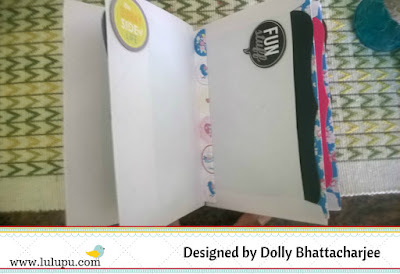 U can add photos on both the sides of flaps as well as on photo mat, so there is space for 5 photos on one single page only. In total it has space for 30 pics with just 6 pages. Isn't it great! And its super easy to make. The size of album is 6*7 inches. The covers are made of chipboard. For this album I wanted to do something different from my usual style. So here I decided to use Altenew vintage roses and flowers stamp instead of using any dimensional flowers and I really love its final look. It has a photo mat as well. The PPs match so well with flowers. Also used Prima wood veneers, glitter heart and liquid pearls. And now comes the pictorial for the album. I have prepared step by step instructions along with the pics for a better understanding. The album cover is 6*7 inches in size and binding is stack the deck which you all must be familiar with. 1. For the pages we need two different types of CS. A type- It measures 4-1/2"* 8-1/2", score this one at 5" on 8-1/2" side (as shown in pic). As you can see in the pic there is a 1/4" overlap at one end, do not score at this point just mark it. Prepare a second piece of same measurement. B type- It measures 11"*6-1/2". Score this at center i.e., at 5-1/2" and fold it. So in total we need two pieces of A type of CS and one piece of B type of CS for making a single page of album. 2. Next we are joining the two narrower sections of A type CS together and if u look at them while holding up, they form a "Z" shape, that's why the name Z flap album. Add a strip of tacky tape to the 1/4" overlap on one of the piece of A type CS and attach the other piece of A type CS to it but it should be inverted (see in the pic). The two pieces are joined now but they are in opposite orientation, one has a valley fold and other one has a mountain fold. 3. Now to create the pocket portion of the page we will take B type CS and the center section of the "Z" shape is slipped down inside the B type CS. Its placement is in a way that a 1/4" space is there at the bottom/top on both the sides. There is a open space above which will be used for attaching the pages to binding. 4. Next keep the open portion up, open the flap (on bottom) hold it in place, hold the center portion down. add a thin line of glue along the edges and fold back the center portion again and glue it. Flip it over, Now open portion is at bottom and fold on top. Open the flap and lift up the center portion and glue it as we did above. While gluing the center portion please make sure that you maintain the 1/4" space at bottom/ top on both sides. So we have a open space on side and flap on the other, on both sides of page. Make other six pages in the same way and as I had mentioned above also use the open space on top for attaching pages to the binding. Make tags for the pockets and the album is done. Embellish it using your favorite pps and other embellishments. Hope you like it. Add you entries for current challenge here. This is Tanvi, with my second post for this month's theme - MAKE A MINI. 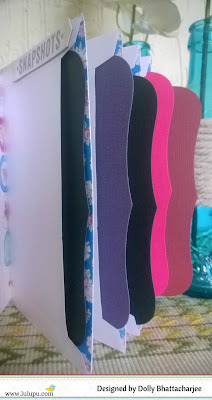 This fortnight the DT focuses on different inserts to maximize photo & journaling space in a mini album. I have a tutorial on a pinspired double pocket belly insert, modified for a 6X6 page. For this insert you begin with a 7 1/2X11" sheet. Score on the 11" side as shown in the picture. Rotate it & score on the 7 1/2" side as shown. This is how the insert looks after folding. Distress all the folds & papers with Vintage photo DI to highlight the pockets. Adhere pattern papers. 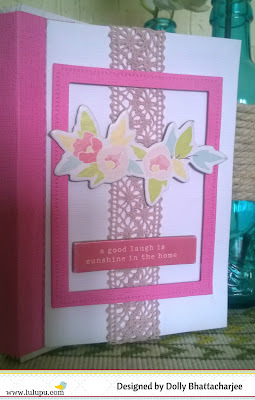 I have used Prima - The Archivist papers which I received in my DT kit. These are my all time fav papers after Coffee Break! The double pocket insert is ready. Adhere this using scor tape (on the 1" flaps) to a 6x6" page, this forms a belly band in which a large tag can be tucked in. 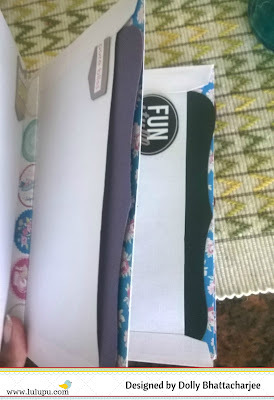 The final look of this easy to make insert with space for lots of tags & pics of different sizes. If you all liked this tutorial please leave some love and do join us in this months challenge here.